I’m calling it. Bieb is now officially wrapped up. I’ve accomplished the bare minimum I set out to do with Bieb, and learned a lot of extra things along the way. But motivation to continue any further has dropped to near zero. And I’m okay with that. Fair warning: this is a long post. Consider the above to be the TLDR version, and whatever’s below as a peek into my personal notes and thoughts. Read on at your own risk! Still here? Allright, here goes. Bieb was a fun project. Now it’s “wrapped up” / abandoned. 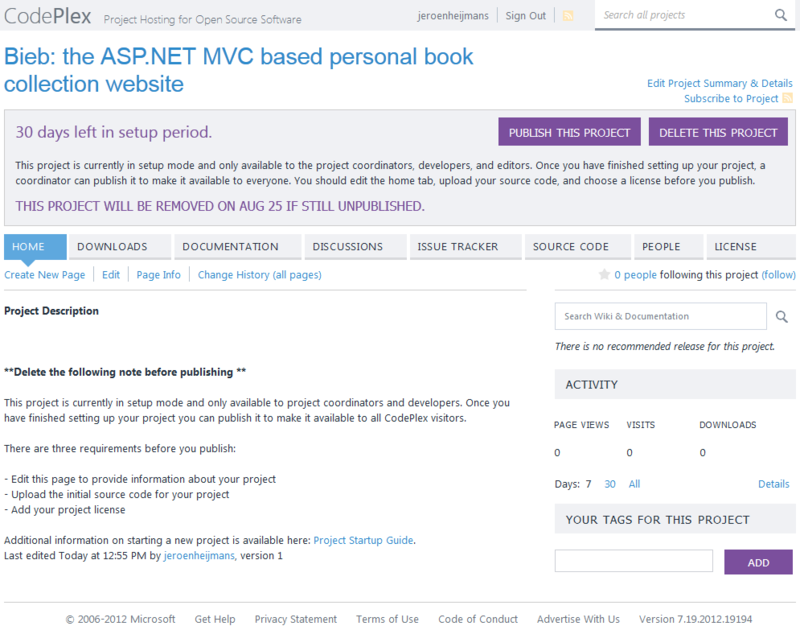 Proper errors in ASP.NET MVC are hard. 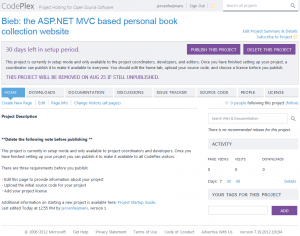 ASP.NET MVC is a nice framework in general though. Database integration tests for NHibernate are useful and easy to set up. 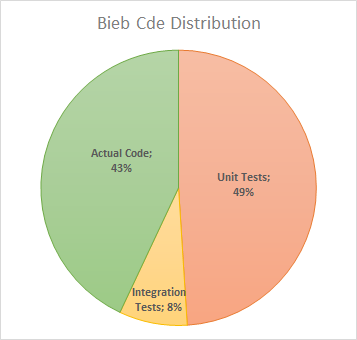 Bieb is a successfull TDD experiment. Designing (the domain logic for) an entire application is fun! 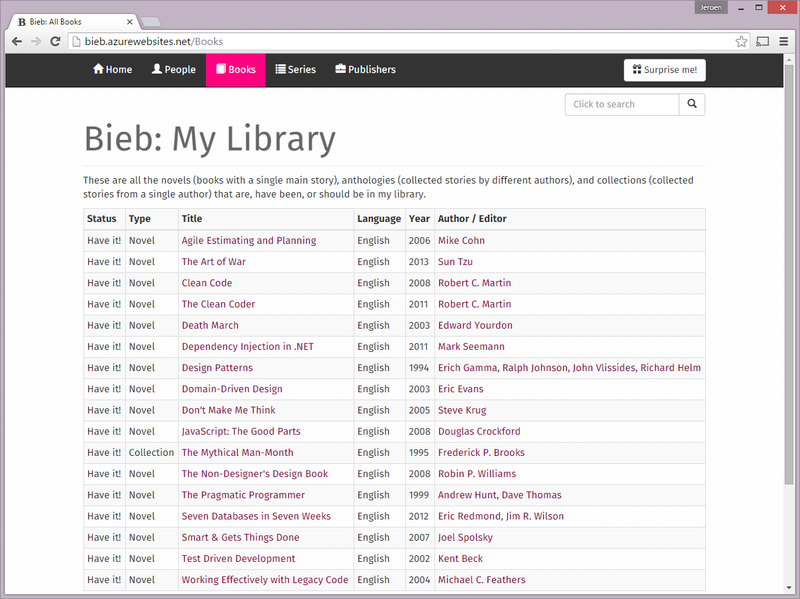 Website project based on ASP.NET MVC for managing and displaying your personal book collection on the web. And that was actually pretty close to what it turned out to be. Note that Bieb is not solving a new problem, nor is it solving a problem in new ways. 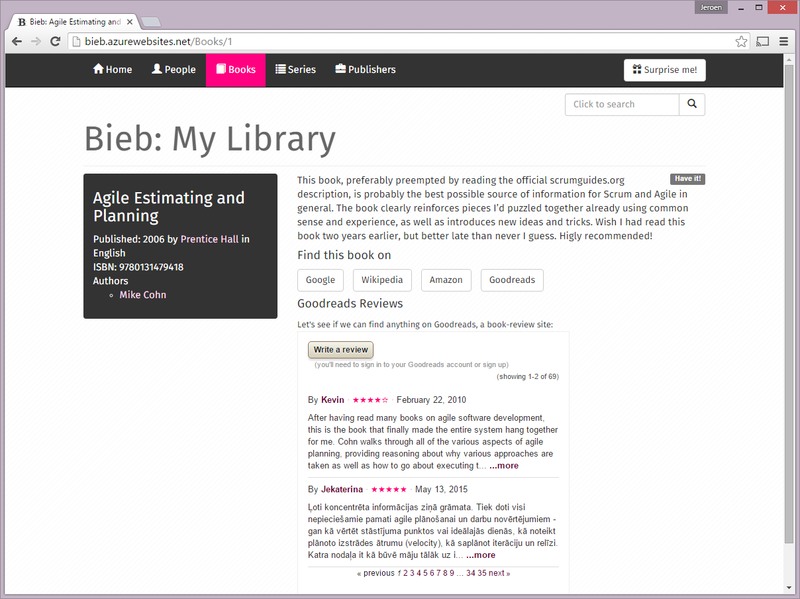 There’s GoodReads, which is a great site that does 90% what Bieb does and more. Bieb was not meant for us to get rich with a “next big thing”; it was meant as a fun project to toy with technology. Before I get to the positive things about this project, first some negatives. Bieb had to be a replacement for a version of this app I’d hacked together in PHP. With PHP however, it’s very easy and cheap to get some hosting, and very easy to set up a deployment. With .NET, there is no such luxury. Private / shared hosting of .NET sites is expensive. The best option seemed to be Azure (as I had a MSDN subscription that comes along with some Azure credits), but Azure has a very steep learning curve compared to getting a PHP site up and running. Put in another way: Azure feels solid, but it also feels big and “enterprisey”. There’s just so many buttons and settings and “thingies” that it feels impossible to get started. Watching tutorials doesn’t help much, because your choices are (a) a very specific 20 min tutorial that doesn’t cover all your needs or (b) watching a 6-hour Pluralsight course and still being covered only 80% of the way. Add to that the fact that it’s still under heavy development (which mostly is a good thing, but doesn’t make the learning curve any better), and you’re set up for frustration. I tweeted that I found it confusing that one Azure portal redirects me to yet another Azure portal. Azure support tweets back redirecting me to MSDN forums. In the forum thread, I get redirected to yet another forum where I should post my findings. I think I would now like to redirect Azure to a place where the sun don’t shine. Don’t get me wrong though: I love .NET development and Windows hosting in general. Both Azure and hosting yourself are fine options for business-type projects. However, I’m deeply disappointed in using Azure and .NET for web hobby projects. It’s probably the main reason I’m abandoning wrapping up Bieb, and the main reason I’ll be focussing on other tech for hobby projects in the near future. A very specific “negative”, but one that annoyed me to no end. I think I’ve tried to attack this problem 5 times over, and failed every single time. No YSODs. Ever. Making sure that if your app fails it does so elegantly is very important IMHO. Proper HTTP status codes. That means 404s for non-existent static resources, MVC routes that can’t be resolved, but also “semantic” 404s for when a domain item (e.g. 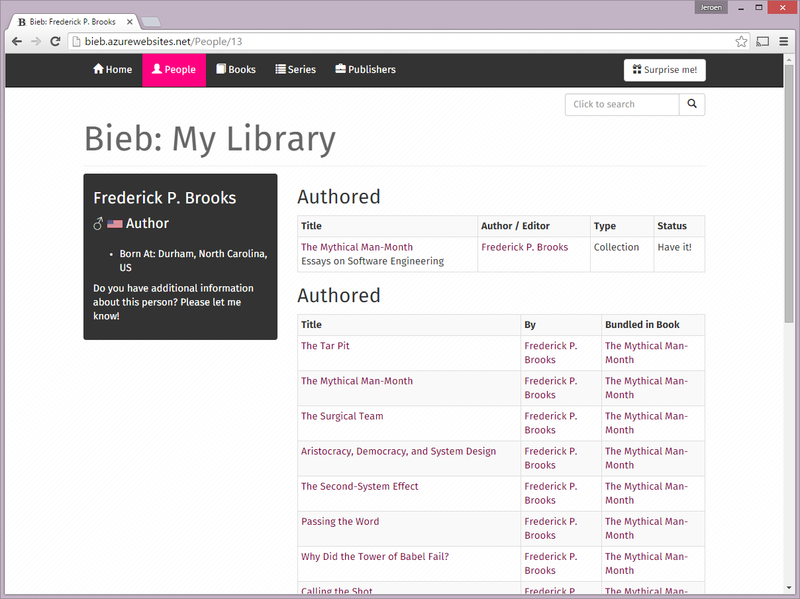 a “Book” or an “Author”) was not found. A nice error page. That means a proper MVC page when possible, one that gives options (like a Search partial view) and relevant info. Failing that, a nice, styled static html page. Proper error logging. The logging and error handling code should be unobtrusive to the business logic. If a request fails (i.e. a 500 error) it should be caught, logged, and the user should be directed to a meaningful, useful page with proper content but (again) also a proper HTTP status code. Whenever I tried to tackle these requirements, I would fail to do so, and clicking through the online resources about this problem I would inevitably end up at Ben Foster’s blog post on this problem. That excellent post notwithstanding, I have never gotten this to work on IIS or IIS Express. There were also many positive aspects about fiddling with Bieb. Here are the main ones. Which is a nice way to fix a database issue in a test-driven manner. Currently my approach has one big flaw though: the tests are not isolated. 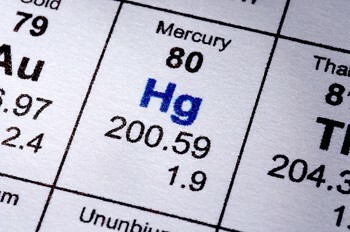 Each test has to account for previous tests possibly having left data in the database. For the tests written so far that doesn’t matter, but it’s an accident waiting to happen nonetheless. Drop and recreate the database before each test. But that’s probably slow. Wrap each test in a transaction, and roll it back at the end. But that exludes the option of testing things that require actually committing transactions. Truth be told, I wrote most database integration tests because I was unsure of how NHibernate would function and/or handle my mappings. And for that (i.e. learning NHibernate) the current set up worked just fine. If I were to continue with Bieb there would most likely come a time where I’d go for option 2. I think Jimmy Bogard typically advocates a similar approach. PS. For what it’s worth, I’ve written a GitHub Gist with a minimal setup for creating NUnit+NHibernate tests, specifically geared to creating minimal repro’s to share with colleagues or on Stack Overflow. It’s short and to the point as it delegates the other responsibilities to (injected) dependencies like the Mapper and Repository. In addition, Razor views are also pretty easy to write. At the least, they are a breath of fresh air after WebForms. 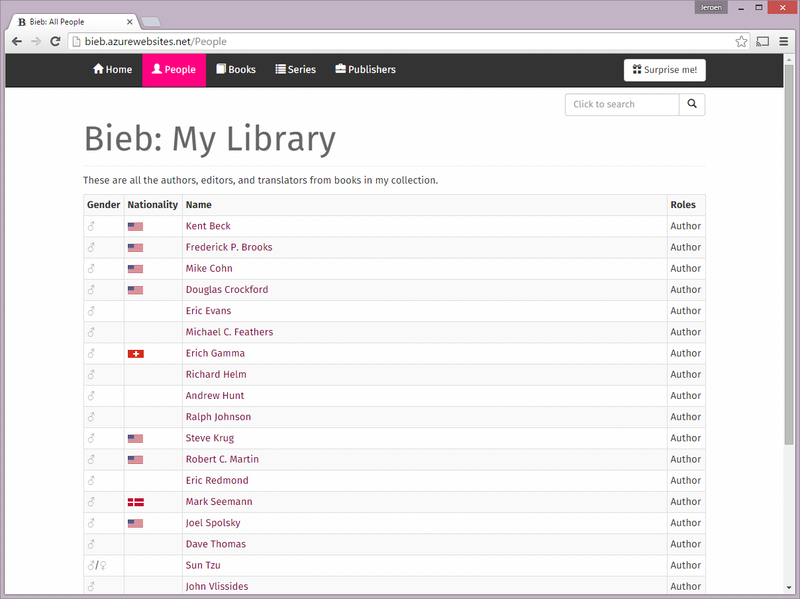 Having said that, I’m very pleased with how Bieb was a great way to learn ASP.NET MVC. Even though Lines of Code is hardly ever a good metric (it would be easy to inflate these numbers one way or the other), in this case they do reflect the actual state of the code base. Note that this does not include view code (obviously), nor does it include client side code (there isn’t nearly any; more on that later). Which is worth the fact that it’s not a “clean” AAA-style unit test, in my opinion. Where’s the client side code!? This may seem silly anno 2015, and truth be told: it is! Bieb was a vehicle for me to learn mostly server side tech. Most of my hobby projects, as well as the larger part of my day job includes client side programming. I’m confident I could improve Bieb (a lot) with rich client interaction, but haven’t found the need to do so (yet). I was aiming to get a 1.0 release out with mostly MVC code, and work on improved client side components after that. One important thing to note: I was very pleased with how far you could get with just Razor in creating html. I was also pleased with how much fun it was to generate static content, which Bieb is mostly about. 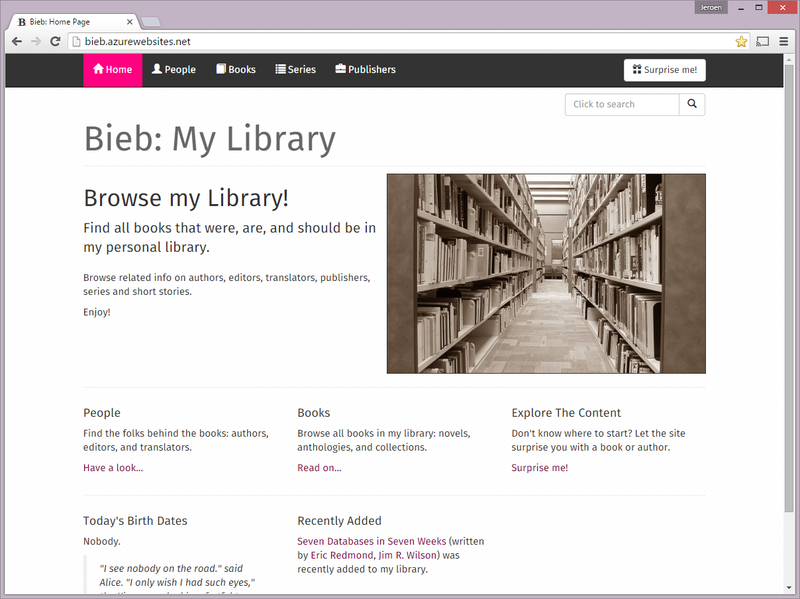 You can check out bieb.azurewebsites.net, at least as long as my free Azure credits last. The CodePlex Project will go into hibernation, but will remain available for as long as the wise folks at Microsoft keep it up and running. Some screenshots can be found at the bottom of this post. Setting up Logging. A real website needs this, but setting it up is a chore. Setting it up so that it’s unobtrusive can even make it a tricky chore. Setting up a Dependency Injection Framework. DI itself can be a great help, I find that it kept my code clean and testable by default, but choosing- and learning how to use a specific DI container didn’t feel particularly interesting. A proper Unit of Work pattern. It’s necessary, but certainly not my favorite bit of coding. And it probably shows in my codebase, too. Razor Views were fun to write. Designing the Domain and its logic was fun, even though unfortunately sometimes the underlying persistance layer leaks through. Project and Solution structure: fun things to think about, even though Bieb is just a small application. Routing: it feels good to have nice, pretty URLs. Controllers: because I did spend some time on the things I did not like, the controllers did end up looking pretty good. Database structure, written through NHibernate mappings that actually is used to generate the database from code. Design. Truth be told, the design is at most 49% mine, but that doesn’t make me any less proud of the end result. Bieb was a fun project to do. I learned a lot. And even though I had many more plans, and even the start of a big backlog, it’s time to move on. Farewell Bieb, slumber in peace! This is a follow-up to my previous post on Hg Hosting Providers. I found that on the surface all four of them were very similar. From the four providers I investigated, CodePlex overall felt most intriguing, so I decided to start by trying out that one. Note: I participate in another project, which I will be uploading to Bitbucket (because that’s the only one that supports small private projects at no charge), so I may be doing a follow-up on that provider too. The project has now entered the “Setup Period”. This gives you 30 days to set up the project, i.e. before you have to go live. This was in fact a welcome surprise to me, because since this was my first time coordinating a hosted project the setup period allows me to calmly check out all the features. Keeping in mind that eventually I would be hosting the code online, I had already started with a Hg repository, committing my changes locally. There are several advantages to using version control while still flying solo, amongst others having backups and traceability. A simple copy/paste back-up of the existing repository, just to be safe. With some effort I got this Hg convert trick to work, changing the user name in commits for the existing repository to my CodePlex username. Make a clone (a.k.a. 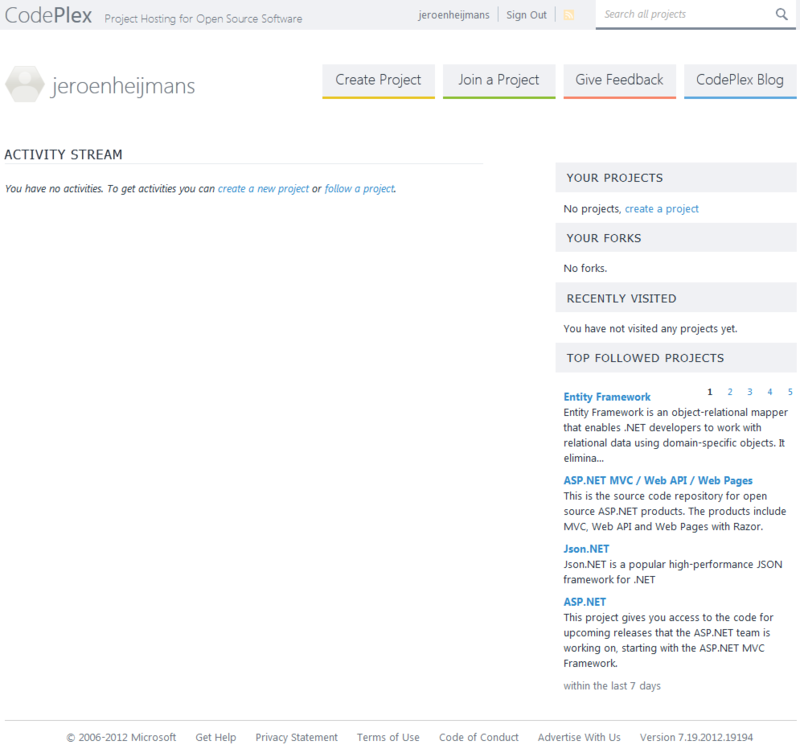 check out) of the project repository from CodePlex to a new local folder. 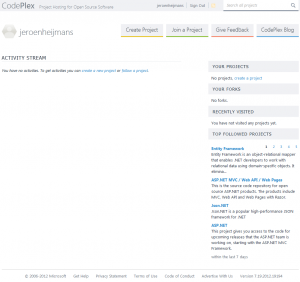 Copy the existing repository over the clone from CodePlex. Some of the hidden files in the .hg folder have to be overwritten. I double checked all files with Notepad++, and in all (my!) cases the clone’s file could be safely overwritten. Using TortoiseHg I now pushed all the changes. In the previous step the CodePlex URL was probably lost, but that was easily remedied by entering it once more. To be honest, in hindsight I don’t know if step 4 and 5 are really necessary. I guess you could safely try just pushing your existing repo to CodePlex: if it doesn’t work surely you’ll get an explanatory error message? 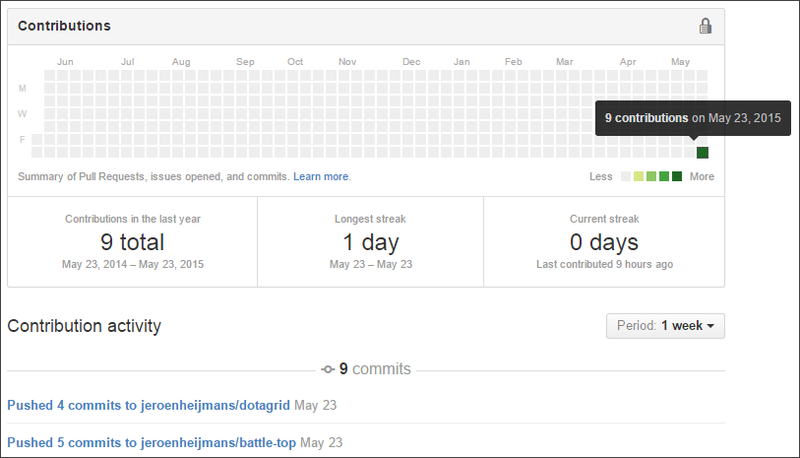 Either way, after completing the above steps my CodePlex project contained a complete history of 40+ commits, only minutes after setting up the project! Home is the first thing you see if you go to the project URL (which is a nice subdomain of CodePlex: http://yourproject.codeplex.com). 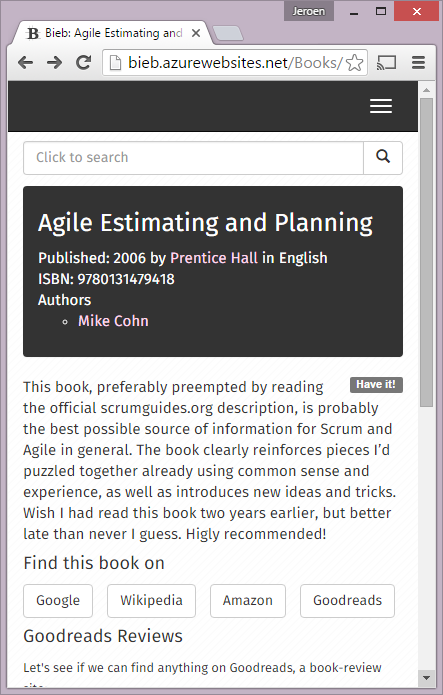 It mainly contains some text to explain what the project is all about, and you’re invited to edit it (with Wiki-style markup). Worked nice and easy for my simplistic purposes. Downloads is the section where you can offer releases, which can have various properties as well as attachments such as binaries or installers. So far I’ve only created two “Planned Releases”, which worked pretty straightforward. Documentation is Wiki-based. So far I’m headed straight for the quintessential documentation pitfall: I’ll create it once the product’s finished. Discussions looks like a forum-based commenting area. Given that the project is one we do together with friends we may not get to use this option much. Issue Tracker is a very basic work-item system. It contains the bare essentials, but not much more. This was a bit disappointing to be honest, I would at least have liked to have some basic formatting, but apparently that’s still a work item on CodePlex itself. Source Code is the section where… well… you can find the source code! It shows all commits in descending order, and even though I haven’t tried it yet it also shows forks and pull requests. If you click on a commit you get to see the diffs for changed files. 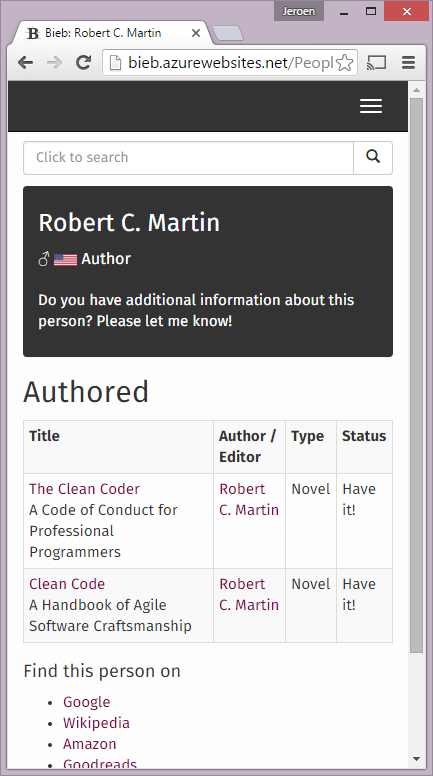 People shows all the coordinators, developers and editors on the project. It’s also the place to invite your team mates to the party! 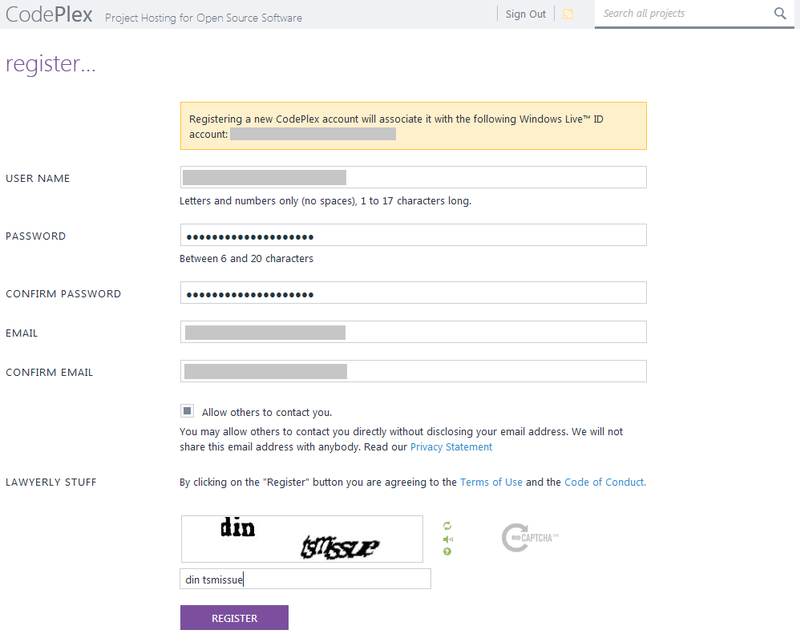 License is where you can view and change the license for your project. 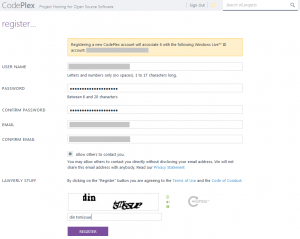 CodePlex allows you to choose from ten different OSI licenses. I’m leaning towards picking the BSD license, but this license stuff feels like a snake pit (with it’s own acronym: IANAL). So far this list of features seems pretty sufficient. At least: I haven’t “missed” a feature so far. All together I’m pleasantly surprised by how easy it was to set all this up. I’m not sure (yet) how it actually compares to the other hosting providers I considered, but so far I’m happy I chose CodePlex. 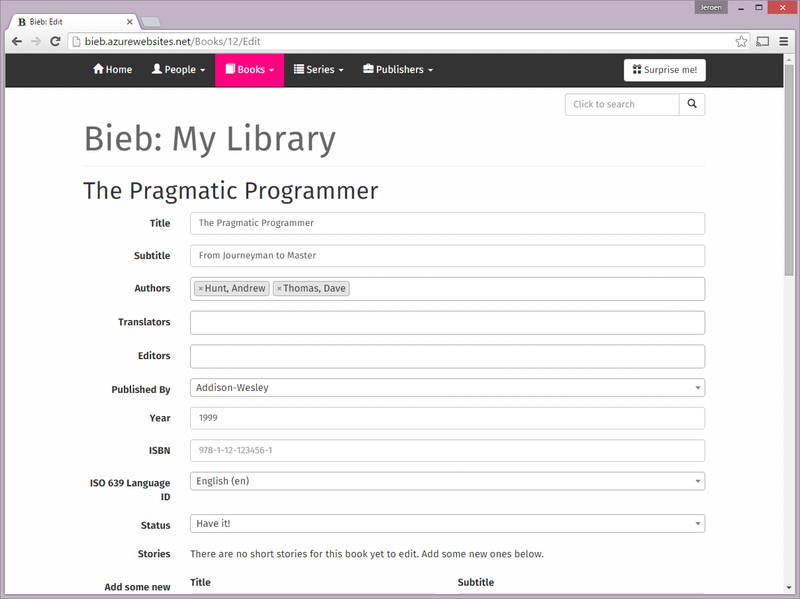 I’m fairly certain our project will be published some time soon, and when it does you can find it at bieb.codeplex.com: join the party!